When the sugarcane’s burning and the rabbits are running, look for the boys who are quicker than flame. Shall we run with them, you and I? Shall we dodge tractors and fire for small handfuls of fur? Will we grin behind shirt masks while caught rabbits kick in our hands? Shoes are for the slow. Pull ‘em off. Tug up your socks. Shift side to side. Chase. But be quick. Very quick. Out here in the flats, when the sugarcane’s burning and the rabbits are running, there can be only quick. There’s quick, and there’s dead. 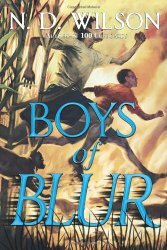 Boys of Blur can be thought of as Beowulf in the Florida swamp. With zombies. Charlie Reynolds has come to Taper, Florida with his mother, stepfather, and little sister, to attend a funeral. The funeral is happening at a white church on a mound outside of town on the edge of the swamps, in the middle of muck, and ringed by a sea of sugarcane. The funeral is for Charlie’s stepfather’s old football coach, and his stepfather has been asked to coach the high school team in his place. Charlie was in the cane where his stepfather had been raised and played his first football. Over the dike and across the water, he knew he would find more cane and the town of Belle Glade, where his real dad had been raised and played his football. Soon, Charlie meets Cotton, his stepdad’s second cousin, and Cotton says that makes them cousins, too. He takes Charlie into the cane and shows him a mound topped by a stone. The stone has a dead snake on top, and a small dead rabbit beside it. But that’s only the first strange thing. They see a man wearing a helmet and carrying a sword. There's drama and danger here. There's tension, because Charlie's mother knows his father lives near, and Charlie sees the old familiar fear in her eyes. And there are secrets in the cane, in the swamp, in the muck. Why do dead animals keep appearing at certain places? And what is the foul stench that comes up in the swamp at night, while Cotton and Charlie watch the helmeted man digging in Coach Wiz's grave? And is that sound the scream of a panther? This book is a bit more mystical than I tend to like my fantasy. But it's excellently carried out, so it didn't bother me while I was reading that by the end I wasn't sure exactly what had happened. Think Beowulf in the Florida swamp -- with zombies -- and you'll have the idea -- Friends fighting monsters together.